Actually, I've read more than 20 books this year. I've got a couple reviews up at Books I Think You Should Read, and I also got behind in writing for a bit, so some just got lost in the shuffle. So yay for lots of reading in 2017! The Honest Spy by Andreas Kollender was another of my wonderful Kindle First books for having Amazon Prime. 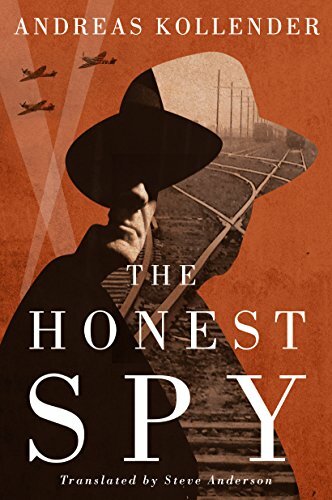 In reading reviews and such afterward, I was intrigued to find that this book was based on a real spy and his actions during the war. Since it's based on reality, I really can't 'complain' about the plot, right? The story is told through an interview with a reporter and photographer, and flashbacks. This explains the one thing I would have liked more of in the book - more insight from other characters. By the time the story is told, the other characters are no longer accessible. It was super interesting to hear Fritz Kolbe (the spy) describe how people changed as the Nazis took over Germany, as well as watching his actions, vs the quiet state-department employee he considered himself to be. War changed not only their circumstances and surroundings, but their very perceptions of the whole wold forever. I think the best reason to read this book was because it really did happen. It did not read as dry as one may expect from a non-fiction book, but the details filled in to tell it in a better story-telling fashion didn't change the reality. I don't read for leisure as much as I'd like to. This book sounds like something I'd like to make the time to peruse through though. How did "normal" people get sucked into the fanatic NAZI way of doing things? Important topic for people to understand to help prevent from happening again.